Animal Welfare Organisations are pressing for the Government to introduce legislation that enshrines Animal Sentience in UK law when we leave the EU.The event was hosted by cross party MPs including Zac Goldsmith MP( our Patron) and many MPs, peers and animal protection organisations representatives urged for action at the event. Animals will lose vital legal protections post-Brexit unless Animal Sentience is included in UK law. 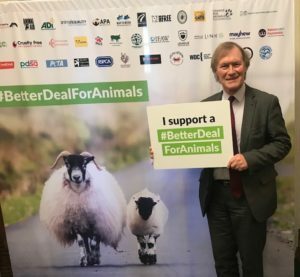 Animal welfare organisations came together to call for a law that will create a duty for all Ministers in the UK to fully regard animal welfare in policy-making and ensure that animal sentience laws are not weakened once we leave the EU. Celebrity animal welfare campaigners have launched a petition calling for immediate action. Michael Gove said at the event: “Animals are sentient beings who feel pain and suffering, so it is absolutely right that we recognise this in UK law after we leave the EU. 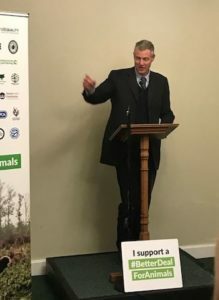 I was delighted to attend this important Parliamentary reception and hear from the many charities involved about how we can maintain and enhance our reputation as a leader on animal welfare. Animal sentience is currently enshrined in EU law but has not been carried across into UK law. 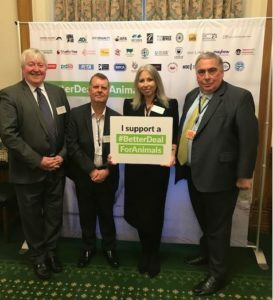 Celebrity animal welfare campaigners have launched a petition calling on the UK Government to ensure this will be explicitly enshrined in law and for any future legislation or government policy to fully consider its impact on the welfare of animals.Animal welfare organisations are also calling for a independent Animal Welfare Advisory Council to provide advice to all government ministers at the UK and devolved level. 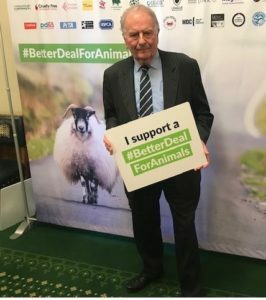 Conservative Animal Welfare Foundation MP Patrons signed a letter urging Michael Gove to enshrine animal sentience in UK law. The letter was sent to the Minister in February 2019.